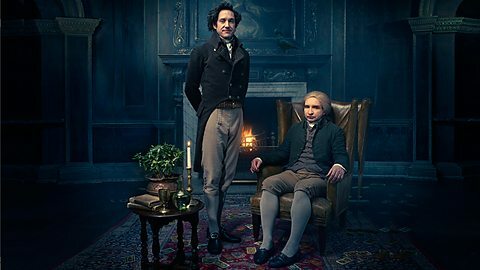 I read Susanna Clarke's novel Jonathan Strange & Mr Norrell years ago - I can't remember it very well at all, but I do remember that I loved it! I especially loved the Jane Austen-style prose (right down to the spellings) and all the academic-history-style footnotes, which were brilliant. This isn't the only novel to use footnotes of course - all the Discworld novels have them - but the way these were constructed, as fake academic references, was particularly fun. The BBC's seven-part TV adaptation of the novel just finished, and it was very good - it'll sit happily on my shelf next to Gormenghast and The Chronicles of Narnia (it shares one of the stars, Samuel West - a very nice actor who once took me and my friends out for a beer, and who played King Caspian in the BBC's Voyage of the Dawn Treader). I especially liked Lady Pole's description of the Gentleman's hair as looking like 'thistle-down' towards the end, reflecting his constant epithet in the book. I also loved how the Raven King looked just like Christopher Lee from The Wicker Man - not coincidentally, a reference to idea of survivals of Druidic, ancient magical rites in the UK. There are a few Classical elements included though. Vinculus has a Latinate name, which makes me wonder if there's an implication that 'English' magic goes back further than Normans or Vikings or Anglo-Saxons or even the Romano-British Celts left behind when the Romans left - although the Latin name suggests Romans, the fact that the story is set in Britain perhaps implies a Druidic influence there (not that Vinculus is necessarily intended to be an ancient Roman or Druid - though it wouldn't surprise me if he was - but the magic inscribed on his body is perhaps Romano-British or Druidic in its ultimate origin, the magic the Raven King originally drew on). The Gentleman also knows his Classics, as he shows in the spell he puts on Stephen Black and Lady Pole to stop them from telling anyone about him. The nonsense they speak is a rather nice and thematic re-telling of fairytales from the fairies' point of view, as Honeyfoot and Segundus eventually realise, though somehow no one seems to realise they are all about fairy abductions, and do in fact explain what Lady Pole and Stephen are trying to say, in a roundabout way. But what Segundus sees when he looks at them is a twist on a Classical motif - a rose on their mouths. In Rome, 'sub rosa' meant in secret (which is why Steven Saylor's series of novels about Gordianus the Finder are subtitled Roma Sub Rosa), and this use persisted into English, either remembered or rediscovered during the Renaissance. So a rose over someone's mouth means they are keeping a secret of some kind, or being forced to do so. The Gentleman may simply have known the English use of the term, but it certainly has a Classical origin. 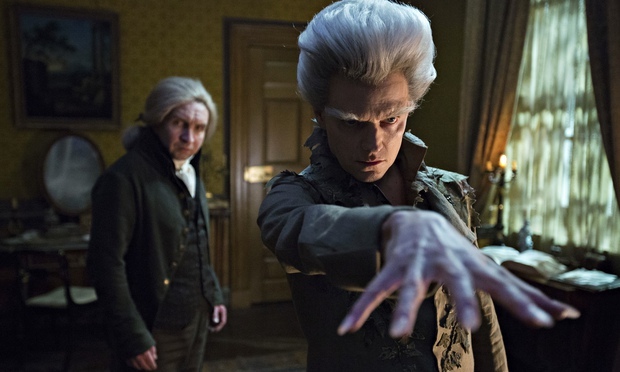 One of Jonathan Strange's spells also has its roots in Classical literature. During the Napoleonic War, in Portugal, Strange reanimates the corpses of some dead soldiers in order to get some information. This use of necromancy for information-gathering is highly Classical, and in particular is reminscent of the gory scene in Lucan's Civil War in which the witch Erictho raises the corpse of a dead soldier to obtain a prophecy (supposedly about the future of Sextus Pompey, though the dead soldier is more interested in prophesying and talking about the underworld in general). As in the series, the corpse is decaying and disgusting, but the dead have knowledge the living do not. history of England since the Norman conquest. It is possible that Clarke and the TV crew were not concerned with using or referring to the Classical world at all. However, the fact that these echoes of the ancient world bleed through, surviving years of history to remain influential, is testament to the enduring impact of the ancient world on the modern, even when we can't see it directly. Edited to add: As my colleague Louisa Mellor at Den of Geek points out, there's also a definite Orpheus and Eurydice vibe to Jonathan and Arabella's story. This post contains spoilers for all aired episodes of Game of Thrones, all published books, possibly published snippets from as-yet-unpublished books, material from online interviews, fan theories - it's a veritable spoiler-fest, is what I'm saying. Now that the dust is starting to settle, it's clear that Season Five was the most Classics-y season of Game of Thrones yet, and all the more awesome for it. Most obviously, of course, this season we got GLADIATORS! As many of you know, I am an absolute sucker for a good gladiator story. I love them. I can't get enough of them. I should probably worry about what that says about me as a person. But anyway, what's the one thing that could make a gladiator story even more awesome than it already is? DRAGON. I was so happy with the way the TV series adapted Ser Jorah and Tyrion's story this season, which for me was much more effective than the books. Everyone involved has clearly seen Gladiator as many times as I have, and used it to frame their story, to great effect. And so we got the warm-up gladiator sequence, in a small fighting pit with fewer deaths and more optimism as Jorah fought his way to stand in front of his Queen/love of his life once more. That gave us the wonderful moment, as yet unreached in the books, when Tyrion and Dany finally came face to face and the various plot threads of the whole enormous saga finally started to converge. It wasn't over yet though, as this was all build up for this year's Episode 9 Grand Climax. 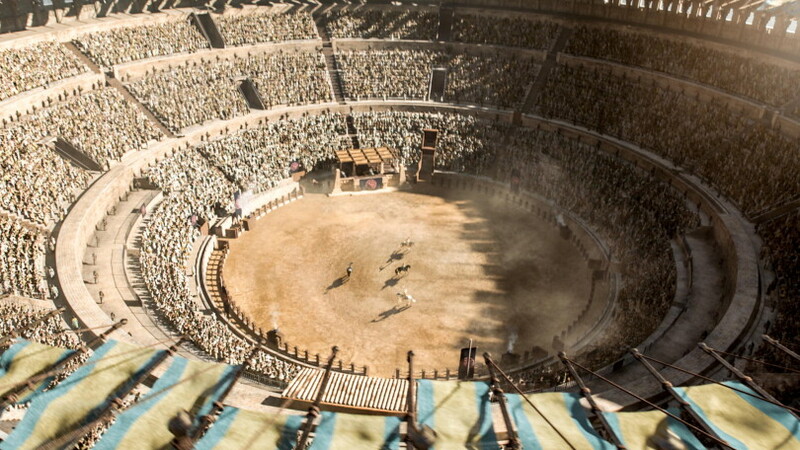 Like the earlier, smaller episode, this featured shots lifted directly from Gladiator, starting with a glorious pan over the huge amphitheatre - the book's description of fighting 'pits' wisely ignored in favour of the more spectacular Roman theatrical look. Then it's into the fight, and the drama plays out in a much more satisfying way than in the book. Where Book Dany inadvertently saved an unknown Tyrion from a death he didn't fully realise was planned for him, here Dany watches Jorah, a man she loves (even if not in the same way that he loves her) embark on a suicide mission (the audience knowing, as she doesn't, that he is already dying from greyscale). I was on tenterhooks with every look that passed between them - I love this couple and was so happy to see them sharing screen time again. With the series going so drastically off book and killing numerous characters still alive in the source material, it was also the first gladiator fight I've watched in a long time in which I genuinely didn't know what the outcome would be (Spartacus is hardly going to lose in his first fight, for example). Then there's that heart-stopping moment when Jorah throws his spear towards the royal box. I'm sure I'm not the only one whose brain did a confused somersault for a few seconds. This shot comes straight out of Kubrick's Spartacus, in which Draba attacks Crassus et al in their box rather than kill Spartacus, the act that sets off the rebellion. In a twist here, Jorah is not aiming at Dany, but at a Son of the Harpy coming up from behind her to attack - here, the rebellion is already happening and he is trying to stop it. Then comes the moment when he offers her his hand and she takes it - a symbolic gesture that seems to me to indicate that she has finally forgiven him. As an incurable sappy romantic, for me it was the most satisfying moment in the show since Jaime jumped into that bear pit back in season three. 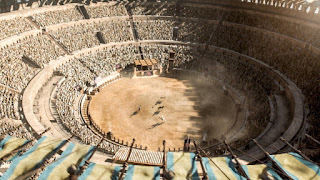 And so Drogon swoops in to rescue Dany from imminent death, leaving her friends looking up in awe, and one very happy viewer who, wandering around the actual Colosseum two days later, was left half convinced every seagull was really a dragon. Dragon-spotting at the Colosseum last week. Drogon sadly failed to make an appearance. This wasn't the only Classical theme in this season, though. Stannis Baratheon learned the hard way that sacrificing one's daughter to the gods rarely ends well, though in his case he learned it a lot more quickly than Agamemnon did (after sacrificing his daughter Iphigenia to appease Artemis and get the winds he needed to sail for Troy). I loved the detail that Selyse broke before the end, trying to save her daughter and giving in to despair when she couldn't. Selyse Baratheon is no Clytemnestra - she was fine with this plan up to the last moment, and whereas Stannis had shown his daughter a lot of affection over the years, she had shown none. Her last second change of heart might be part of a rather irritating notion that women are especially vulnerable to the suffering of children, seen in Episode 8 in which the new, very likeable character Karsi dies because she can't bring herself to fight off zombies if they happen to be in children's bodies. But I like Selyse's sudden attack of conscience - it's a sign of just how horribly far Stannis has gone, and her ultimate fate is reminiscent of another Greek tragedy, as Creon's son and then his wife commit suicide following his condemnation of his son's fiancee Antigone, leaving him to realise just how terrible the consequences of his own stubbornness have been. In ancient literature, while Iphigenia stayed dead in some versions of the story, in others she was miraculously saved by the goddess and whisked away to Tauris. Given the horror which greeted Shireen's death among fans, it's not hard to see why. In Shireen's case, it's unlikely that a miraculous escape is in the offing - Game of Thrones doesn't generally work that way, and her blood-curdling screams were as good as a dead body in terms of finality. But that brings us to the other major Classical moment of this season - the death of Jon Snow. The assassination of Jon Snow is clearly set up and filmed to echo the death of Julius Caesar, as a group of men, some of whom were close allies, some of whom he'd pardoned for earlier opposing him, surround him and stab him to death. I swear, when Olly came up to deliver the final blow, I fully expected him to say 'And you, boy?' or 'You too, Olly?' or words to that effect. He stuck to just 'Olly?' in the end, but the point was more or less made. Then falls Caesar. We're now left with a bizarre sort-of-cliffhanger. Jon Snow in the books is not permanently dead - Melisandre is right there, he can warg into Ghost, and George RR Martin has almost good as confirmed that we haven't seen the last of him in interviews. However, Benioff, Weiss and Kit Harington are all absolutely insistent that Jon Snow in the TV show is really, properly, definitely dead. It wouldn't be the first time a character raised from death in the books stayed dead on the show - Lady Stoneheart is still nowhere to be seen, and Mance Rayder appears much more definitely dead. But does it make sense? Everything in this season and the preceding seasons seems to be building up to Jon Snow being resurrected by Melisandre. She comments on Beric Dondarrion's resurrections, she takes a great interest in Jon, she returns to the Wall just in time for the assassination. We also got a series of heavy-handed hints that R+L=J in Episode 4 of this season, which is all pointless if Jon is dead. (Unless, I suppose, Melisandre plans to use his blood for something, but that's fast running away into the snow. Perhaps she'll do some kind of spell over his dead body, with Jon himself the sacrifice?). Why set all that up and then ignore it? I'll be sorely disappointed if Jon stays dead, not just because I'll miss Kit Harington (though, that too) but because it doesn't make narrative sense. Now obviously, in real life, death does not always make narrative sense and that's something Martin has consciously tried to replicate in his story, most notably in the death of Robb Stark. But the parts of history that we are the most keen to re-tell in dramatic form are, unsurprisingly, the parts with a strong narrative. Julius Caesar's death was a real event, but it also makes a great story, because he left behind a power vacuum into which Mark Antony and Octavian both tried to step, fighting it out until one survived. Robb Stark's death did something similar, taking one more candidate out of the War of the Five Kings and leaving Stannis and the Lannisters to continue their struggle to reign supreme. But what does Jon Snow's death do? It leaves us with no one to follow or care about at the Wall except Melisandre, Davos, Tormund and Dolorous Edd. Of these, only Davos is really plausible as a key point of view character, and he can't take over the Watch. Are we going to watch two seasons of Alliser Thorne and Dolorous Edd fighting White Walkers? Are Sansa and Theon going to turn up, arm themselves and start leading the Watch? Actually, that'd be kind of awesome. But still, I find it hard to see a version of this story that provides a satisfying payoff to years of build up that doesn't have Jon Snow in it, what with him being the Ice of Ice and Fire, after all. Real history and narrative are, in the end, different things, and a narrative that tries too hard to be realistic in its randomness may prove ultimately unsatisfying as a drama. Classical historians knew that, and were fairly shameless about moving real events around for dramatic effect when they needed to. It remains to be seen whether Benioff and Weiss will understand the need for some kind of payoff, or whether they have a way to finish off this story without one half of the two central protagonists. Personally, I have my doubts about that, but only time will tell.